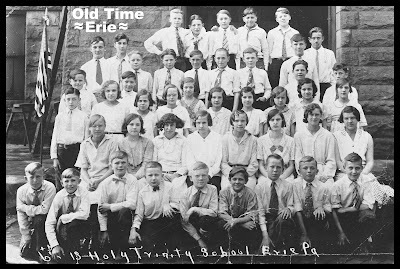 Enjoy cool and interesting stories about unique people and places that shaped the history of Erie, Pennsylvania. Old Time Erie photo contributed by Tom DiLuzio. Holy Trinity Parochial School was located near the corner of 22nd and Reed Street in Erie, PA. It sat between Holy Trinity Catholic Church (2220 Reed St.) and the residence of the Felician Sisters. Holy Trinity School closed in 1997. Thousands of students passed through its doors. A parking lot has taken the place of the school. 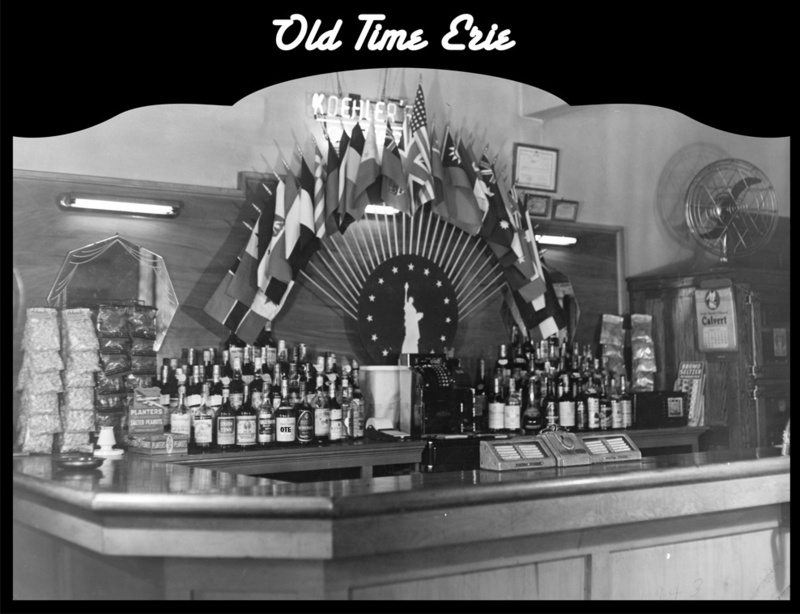 The City of Erie, PA held Northwestern Pennsylvania's Greatest Celebration on September 10th and 11th, 1895. In addition to parades and decorations, the city issued a collectible bronze token with the majestic old city hall on the obverse. 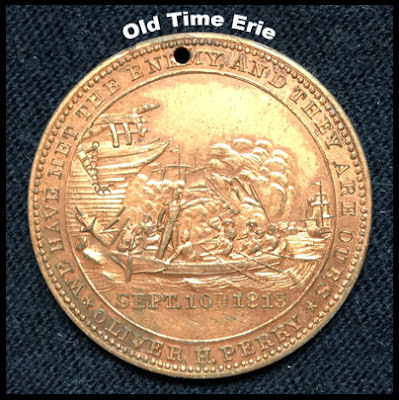 The reverse of the token, pictured here, was a tribute to Oliver Hazard Perry and his heroic role in the Battle of Lake Erie during the War of 1812. As his flagship Lawrence was sinking on Sept. 10, 1813, Perry boarded a lifeboat which was rowed to the Niagara. Perry sent the victorious message to his commander, "We have met the enemy, and they are ours." Amity Inn photo courtesy of Tom DiLuzio. The Amity Inn on West 26th Street in Erie, PA had a pretty cool bar setup in 1943, as you can see in this photo. The most impressive feature was a neon Koehler Beer sign hanging right in the center, above a nice display of flags from around the world. Look to the right and you'll see an antique blade fan on top of an old oak refrigerator with glass doors. Some of the other features in the picture include a Calvert calendar, a Planters Salted Peanuts display, bags of popcorn and beef jerky, and a nice, shiny bar. There is a wide assortment of liquor on display, including bottles of Union Town and lots of other names that are too small to decipher. Joseph Ferraro owned the Amity Inn, which was located at 1334 West 26th Street in Erie. Guy Lombardo had dinner there in 1946. 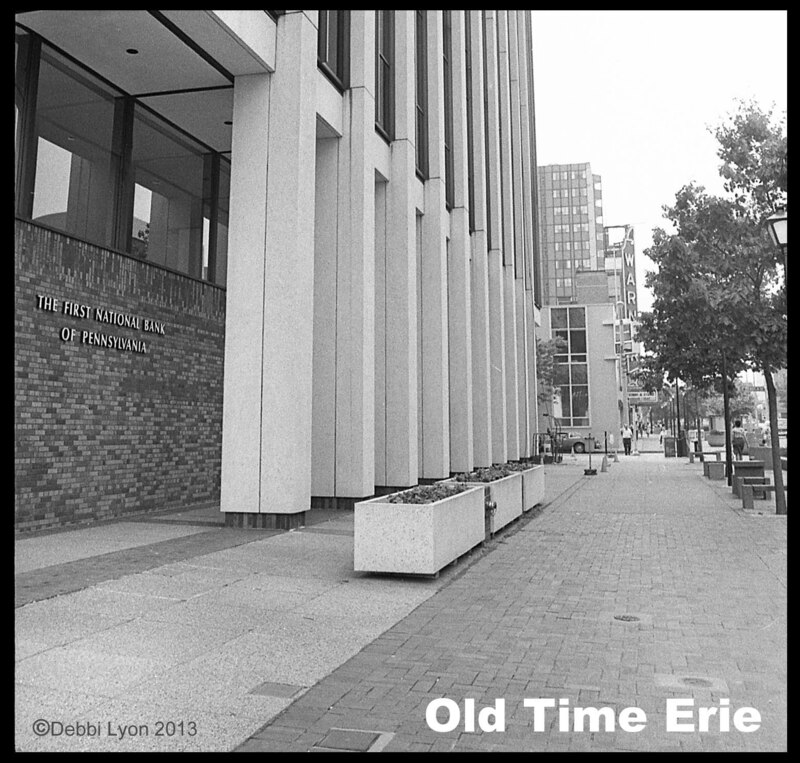 Old Time Erie: Transitway Mall photo ©Debbi Lyon 2013. This is what State Street looked like in May of 1987 in Downtown Erie, PA. The City of Erie wanted to make the downtown area pedestrian friendly, so the sidewalks were widened and benches and planters were installed a number of years prior to this. There were several permanent chess boards in this area, and it was common to see people deep in thought planning their next move. I took this shot in front of the First National Bank of Pennsylvania at 717 State St., looking south. The Warner Theatre, at 811 State St., is visible in the background, as is Methodist Towers. "Conceptually, the mall was a product of the Downtown urban renewal efforts of the late 1960s. Its purpose was to re-energize the traditional downtown creating an exciting atmosphere for both office workers and shoppers. There was a strong feeling that this mall and complementary renewal activities would stem or even reverse the drain of retail from the City center. It did not work." -2000 Edition of the City of Erie Land Use Plan. Prepared by the City of Erie; assisted by Graney, Grossman, Ray and Associates. Highmark Blue Cross Blue Shield currently occupies the old First National Bank Building. The chess boards and and the benches are gone, removed when the Erie Transitway Mall was ripped out in 1993 to widen State St. The Warner Theatre still stands in all its splendor, a tribute to the rich history of the City of Erie. 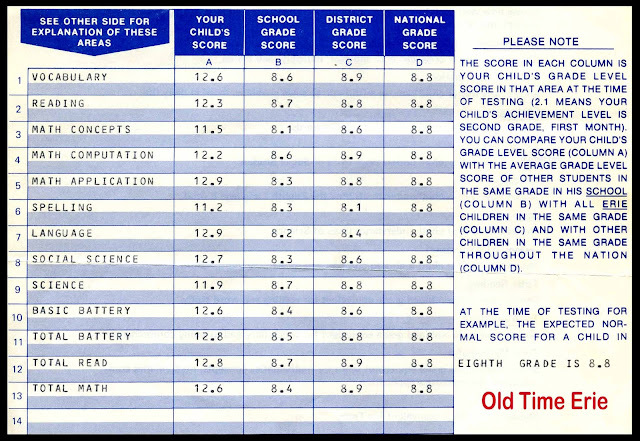 Old Time Erie: May 1980 Achievement Test Report. Pencils down! Remember taking the Stanford Achievement Test in school? I looked forward to these tests almost as much as class picture day. How could you prepare for either one? The results were not instantly available for the test or the pictures. You had to use a #2 pencil to fill in a little circle, make sure you did not poke through the answer sheet and cleanly erase answers that you changed. Tests were administered in the fall and in the spring so there would be some measure of the progress of each student. The School District of the City of Erie used to mail the results to the parent or guardian of each student. Everyone had to take the standardized tests. The upper third of the results page had the name and address of the student. Some of the test names were self explanatory. Math concepts involved solving word problems; math computation was addition, subtraction, multiplication and division; math application was everyday arithmetic. Basic battery averaged all the tests but social science and science. Total battery was the average of all the tests. 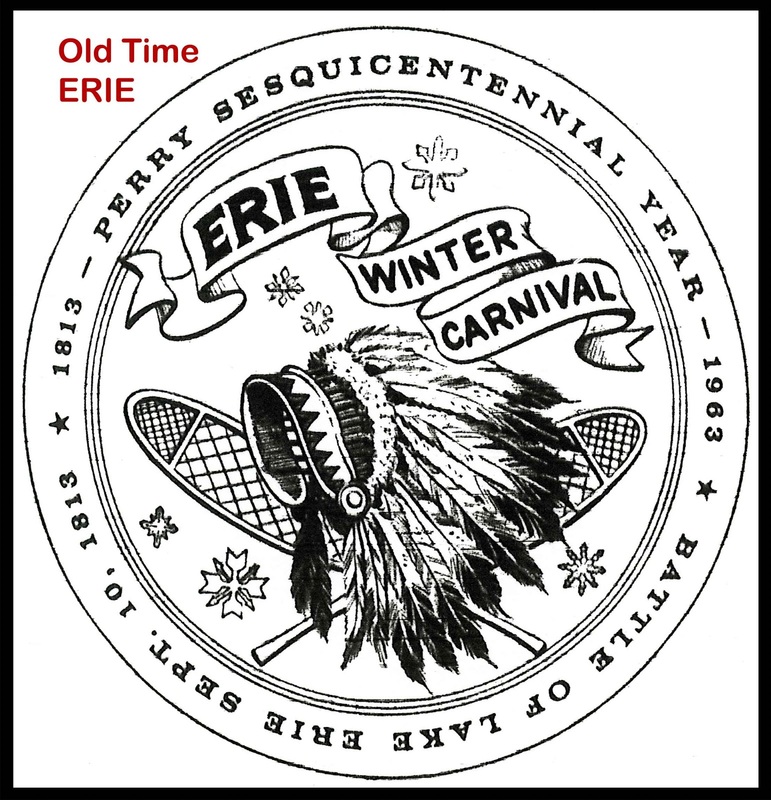 The City of Erie, PA pulled out all the stops to celebrate the Perry Sesquicentennial in 1963. They even released bronze souvenir coins to commemorate the event. This limited edition coin was issued for the 150th anniversary of the Battle of Lake Erie. The Perry sesquicentennial medal was the size of a half dollar and was produced in limited quantities. There are at least two other coins in this series. All three had different redemption dates. 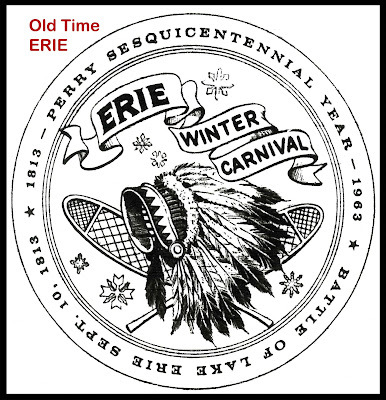 In addition to the Winter Carnival, there were many events such as a reenactment of the Battle of Lake Erie at Veteran's Memorial Stadium, and a series of parades. Red Barn vs. McDonald's. Two fast food restaurants competing for your dollar. A dollar went pretty far back in 1969. 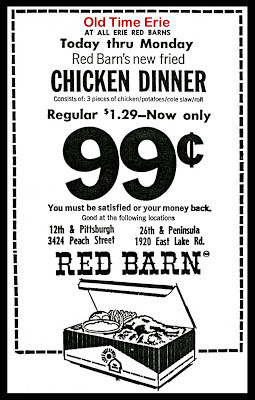 And how could you go wrong with Red Barn's guarantee: "You must be satisfied or your money back." 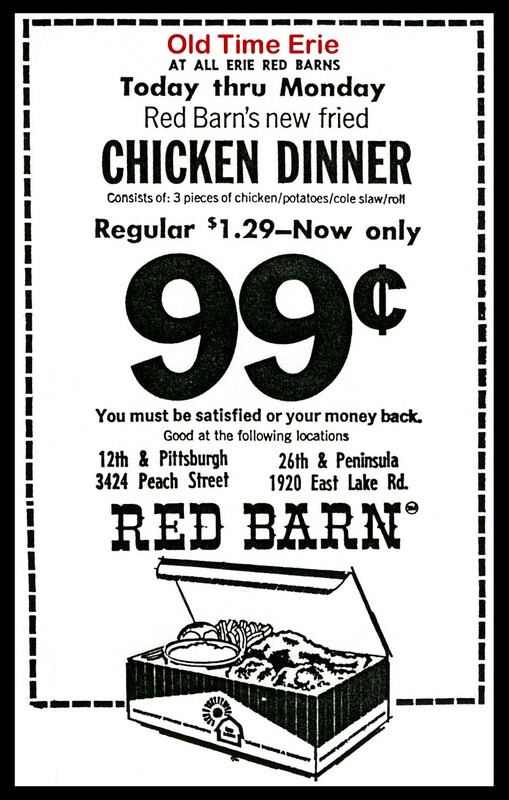 Red Barn had four locations in Erie, PA when this ad was published in the Erie Morning News on Nov. 15, 1969. You could get a meal at 1920 East Lake Road, 3424 Peach Street, 12th and Pittsburgh Avenue and 26th and Peninsula Drive. I remember getting food at the East Lake Rd. location, which was across the street from Edison Elementary School. Plaza 9 is located on the south side of West 9th St. in Erie, PA. Lord Befwick anchored the plaza on the west side. Molly B's was located in this spot in the late 70s or early 80s. The businesses shown here, from left to right, are: I. Michael Brown (117 West 9th St.), J.C. Kramer, the Fabric Shop and Lord Befwick. Boston Store Cameras & Records photo ©John E. Baker 2013. Used with permission. 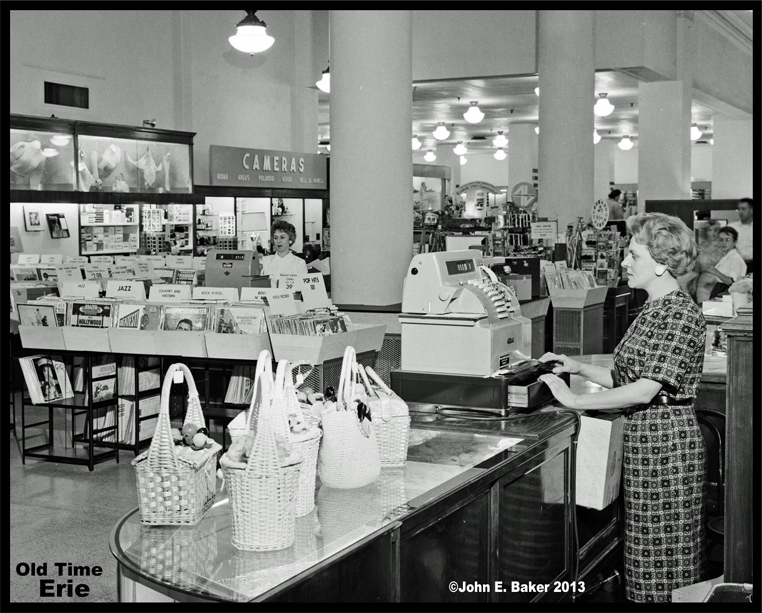 The Boston Store held many treasures within the aisles of its many departments. The record and camera departments were side by side on the first floor of the Boston Store when John E. Baker captured this amazing shot around 1960-61. Elvira, the woman to the left of the post, was the manager of the camera department. Customers had a wide range of photographic products from Kodak, Argus and Polaroid, as well as motion cameras and projectors manufactured by Bell & Howell. Some of the records that are visible include albums by Wanderin' Mark Dinning, Brazen Brass, and the soundtrack to GiGi. You could purchase jazz, country and western and Rock 'N Roll LPs and 7" kiddie records. Pop hits were 88¢ per 45. I think there's even a rack of ViewMaster reels on the right side of the photo. The Boston Store was a retail department store located at 718 State Street in Erie, PA. The building still stands and is on the National Register of Historic Places. Bon Jovi concert line photo ©Debbi Lyon2013. When Bon Jovi announced plans to play a concert at Veteran's Memorial Stadium on July 25, 1987, it was big news. The band was at the tail end of its 15 month Slippery When Wet world tour and was at its peak. Bon Jovi nailed the Billboard year end charts, claiming the Top Pop Album, Top Pop Single and Top Music Videocasstette for 1987. They performed in Japan, England, Germany, Canada, and all the major markets in the United States. So, how did Erie manage to snag a top-name musical artist? Some say it was because Jon Bon Jovi had a soft-spot for Erie, the town where his mother- formerly Carol Sharkey- grew up. Fame brought frequent Jon Bon Jovi rumors, causing plenty of teenage girls to cruise by the house where Jon's grandmother lived in Erie, hoping for a glimpse of the heart-throb. Academy High School looms large in the background of the Bon Jovi concert line photo shown above. I walked along State Street from 26th to 29th Street snapping shots like this. 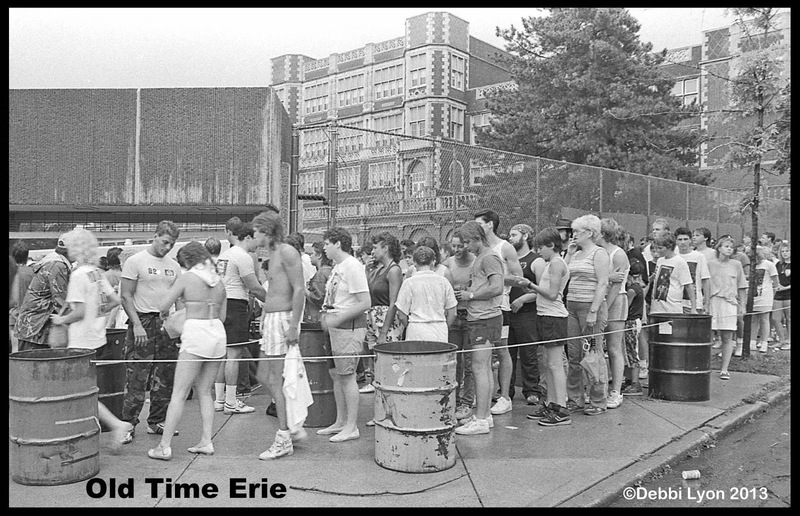 It was a rainy day, and some of the people in line at the Erie Stadium were drenched. Look out, Bay Rat. Steal my cheese and you're a goner. 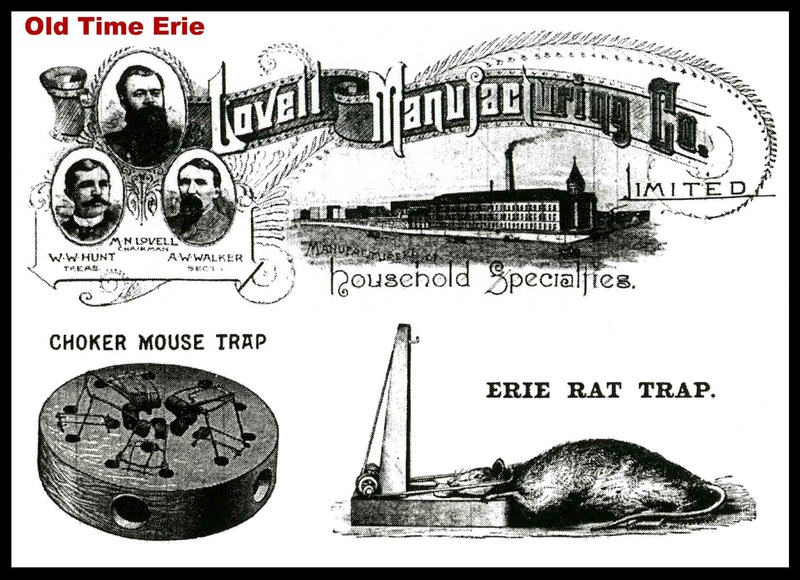 There's nothing humane about the Erie Rat Trap or the Choker Mouse Trap, both of which were made in Erie, PA at the Lovell Manufacturing Company. Founder Melvin N. Lovell passed away in 1895, but his legacy lives on. The Lovell factory, now called Lovell Place, still stands at 153 East 13th St. The footprint of the old factory, which is bordered by French St., East 13th St., Holland St. and East 14th St. still stands, and it's a pretty impressive piece of real estate. In addition to eradicating vermin, Lovell's also made clothes ringers, step ladders, cash registers and roller bearings. The Choker Mouse Trap was a wooden block turned on a lathe into a circle with four holes on the perimeter. When a mouse stuck its head in the hole in search of a treat, it was in for a rude awakening when the wire snapped. The inside of the mouse trap was hollow, so you just picked it up to dispose of the dearly departed. 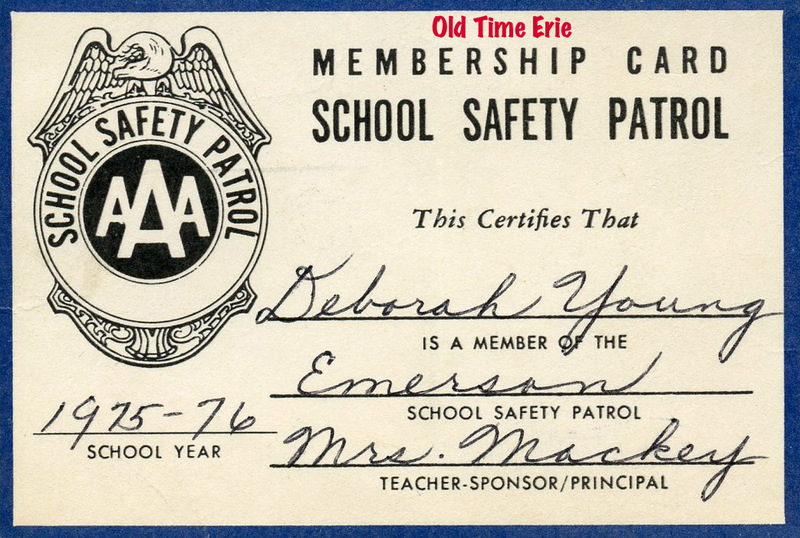 I was a member of the School Safety Patrol during the 1975-76 school year. I had a sweet spot guarding the boulevard at 10th and Cascade, in sight of Emerson Elementary School. Had we not moved to the other side of town, I would have played the coveted role of Captain of the Patrol. We had to turn in our belts and badges at the end of the school year, but we did receive a membership card and a tiny replica of the School Safety Patrol badge. I still have mine somewhere. The ultimate goal was to have a perfect record and win a safety pennant, and a group photo of the patrol members would printed in the Erie Daily Times. The Patrol Member's Pledge was printed on the back of the membership card. I can't recall the last time I saw children wearing the patrol belts. I only seem to see adults positioned on a corner near the school, wearing an orange vest and holding a stop sign. 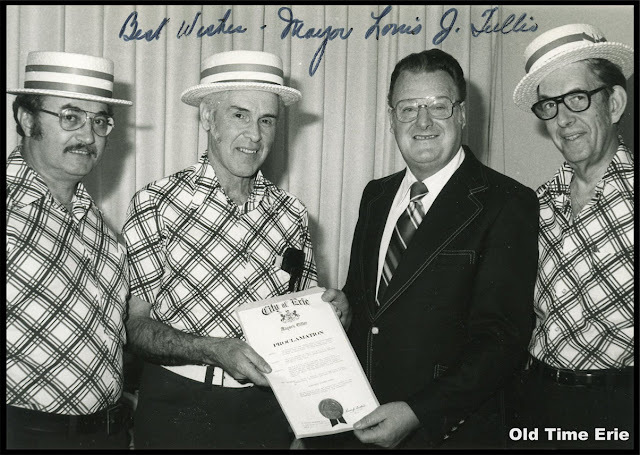 Mayor Louis Tullio presented a Proclamation from the City of Erie to the Erie Chapter of the Society for the Preservation and Encouragement of Barbershop Quartet Singing in American (SPEBSQA). Tullio proclaimed the month of April "Barbershop Harmony Month." The picture might have been taken in 1977. 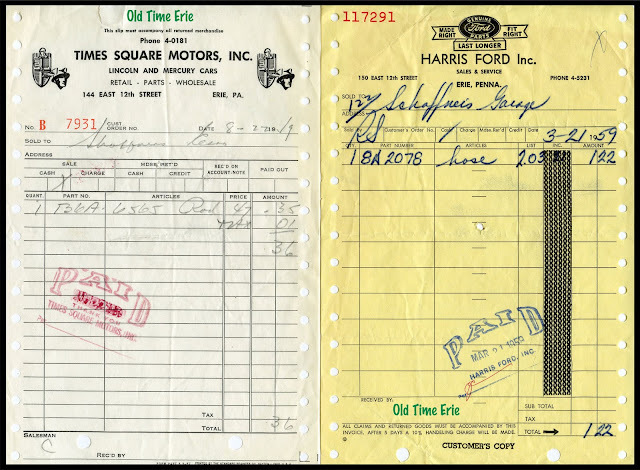 Here are a couple of auto parts receipts from 1959. Times Square Motors sold Lincoln and Mercury cars, along with all the parts and accessories used by auto repair shops and vehicle owners. Times Square was located at 144 East 12th St. in Erie, PA. Harris Ford, which sold and serviced Fords, was located at 150 East 12th St. It's cool to come across old paper items like this because this is the type of item that most people would have throw away. The one on the left was for an item that cost 36¢ and the bill on the right was for a hose which cost $1.22. If you find an old receipt for a new car that was purchased in Erie, send it in and I'll post it here. 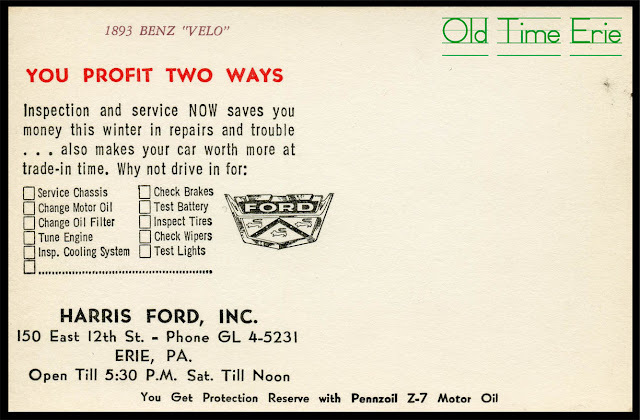 Harris Ford in Erie, PA used to send out postcards as reminders to customers when services were recommended for their automobiles. There are at least six different postcards from this Ford dealership, each having a color photo of a classic car on the other side. This card had an 1893 Benz Velo. Harris Ford was located at 150 East 12th Street. One of the cards that I have is postmarked June of 1964. The unused card shown above has boxes that could be checked to recommend chassis service, check brakes, change oil filter (which appears not to have come with an oil change), tune engine, inspect tires, check wipers, inspect cooling system and test lights. 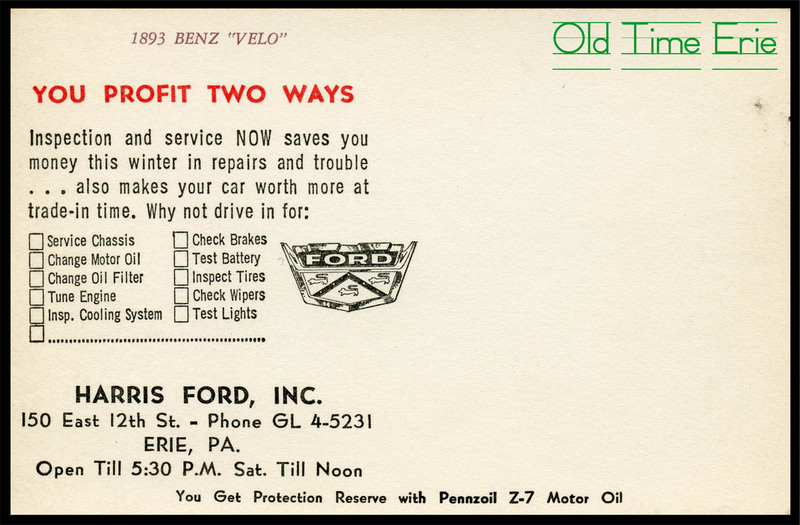 Harris Ford sold Pennzoil Z-7 motor oil. Remember the old car batteries...the ones with that you had to add water to? I sure don't miss those. Old Time Erie photo of Blackburn courtesy of Sam Orrico. The Hullabaloo at 3619 McClelland Avenue in Erie, PA was the place to be in the late sixties. 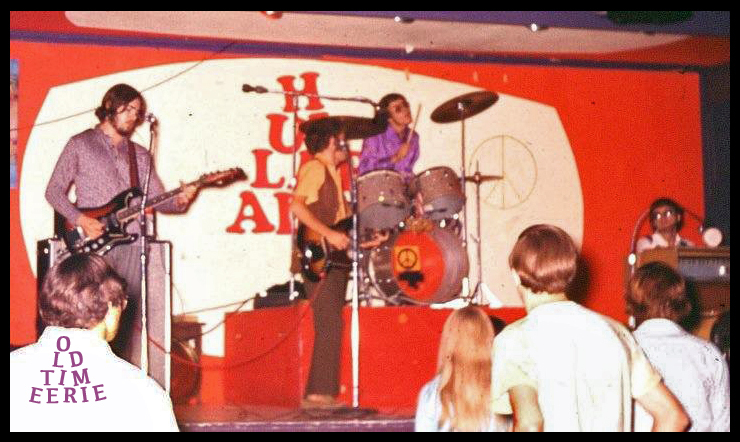 Blackburn, whose members hailed from the New Castle/Ellwood City, PA, played at Hullabaloo around 1970. Blackburn included guitarist Jon Zedick, the late Jerry Wiley on bass guitar, drummer Sam Orrico, and keyboardist David Maranaccio. Hullabaloo was a national chain which included 87 clubs as of January of 1968. The one pictured above was located on the east side of McClelland Avenue. The backdrop included the logo from the Hullabaloo TV series painted on the wall, complete with the outline of a television screen. The building has since been demolished. Locals remember it as the home of the Place, Gadsbys and the Alternative. The Bayfront Connector runs through a portion of the old Hullabaloo parking lot. You could purchase a Hullabaloo Scene franchise for as little as $17,000 in March of 1967, depending on the size of the local market. Booking was done on a national basis, and the deal included training, business forms, advertising, and a sign out front. Ad in Billboard magazine, March 18, 1967. 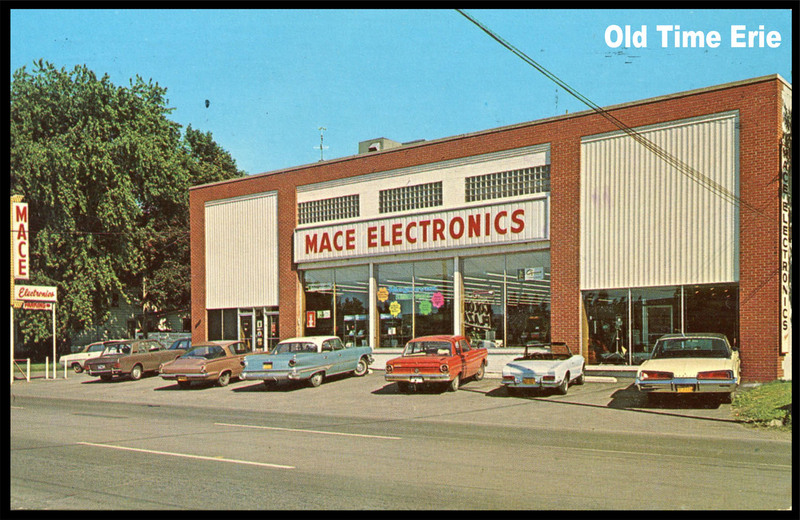 Mace Electronics had a retail 'super store' at 2631 West 8th Street in Erie, PA. 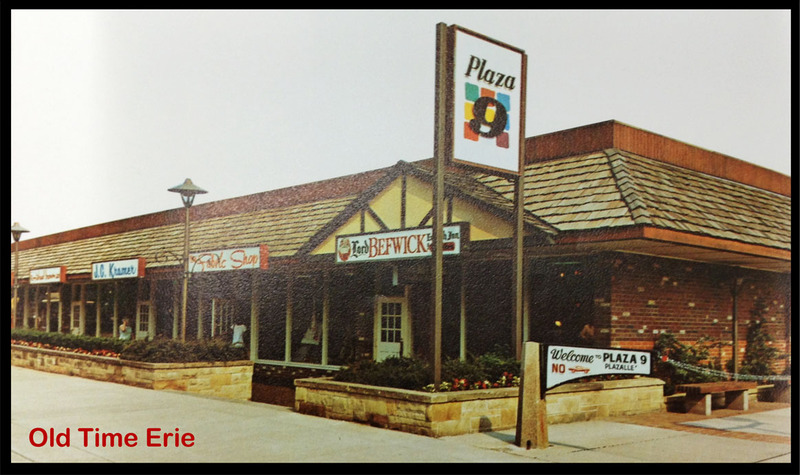 The store had its grand opening on September 19, 1968. This postcard was mailed June 16, 1977 to let a customer know that their cassette recorder had been repaired and they could pick it up at their earliest convenience. I'm not sure when this photo was taken, but you'll probably recognize some of the old cars parked out front. The Colony Plaza sign is visible in the reflection in the window above the red car. Stay tuned for an important announcement.